GMs come up short at Atlanta's "House of Pain"
GMs Aleks Wojtkiewicz and Petr Kiriakov traveled to Atlanta to take part in the Atlanta Open Chess Tournament December 19-21. The two were certainly odds-on favorites to win the 5-round Swiss. As fate would have it, neither could string together a series of wins often necessary in such short tournaments. Georgia's top-rated player IM Carlos Perdomo was able to hold Kiriakov and beat every one else to win the tournament with 4½-½. 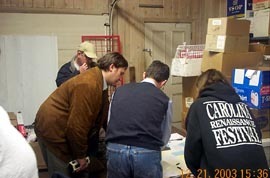 The venue for the tournament was the Atlanta Chess and Games Center which is also known by locals as "The House of Pain." Visiting Masters often score poor results and leave Atlanta, not only many rating points lighter, but with a wounded ego. Expert Anthony Ritz (2166) held both Wojtkiewicz (2653) and FM Grigoriy Kapranov (2396) to draws. Perdomo (2459) would nick Kiriakov (2645) for a half-point in round 4 giving the Columbian better pairings for the finalé. Kapranov was also a victim of "House of Pain" executioners losing both to scholastic star Xiao Cheng (2096) and Brandon Hutchinson (2002). In the last and final round, controversy brewed over the pairings… Wojtkiewicz would play Kiriakov, while Perdomo would play the overachieving Tom Waymouth (1963) on board #2. Wojtkiewicz approached Tournament Director Scott Parker to protest the pairings and of course suggested Wojtkiewicz-Perdomo, Kiriakov-Waymouth. 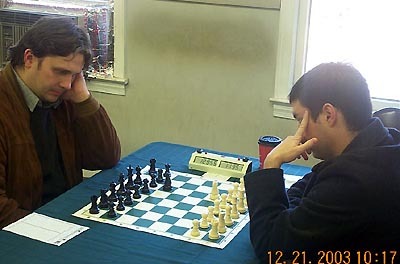 After Parker clearly explained the rules to Kiriakov, the pairings held. The Wojtkiewicz-Kiriakov game started a half-hour late, but only lasted 13 moves as the two agreed to a quick draw. Both ended with undefeated 4-1 scores. Meanwhile, Perdomo stopped Waymouth to score the clinching victory. In other action, FM Todd Andrews (2345) rallied to beat Negash Bezaleel (2130) to take a share of 2nd at 4-1. Scholastic standout Kazim Gulamali (2164) won the under-2200 prize with 3½-1½ beating NM Klaus Pohl (2211) in the last round. A week earlier, 15-year old Gulamali won a "triple crown" at the National Scholastic tournament winning the K-12 individual championship, the blitz title and the bughouse championship (teaming with William Stewart). Gulamali, is the world's top bughouse player with an ICC rating of 2728. He has been the subject of local media and there appears to be more to come. Kazim's father, Mumtaz Yusef, also competed in the tournament. Scott Parker (back to camera) explains situation to GM Petr Kiriakov as Tom Waymouth (right) and Gary Southerland (far left) look on. 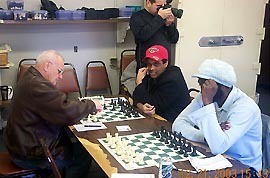 Negash Bezaleel waits on FM Todd Andrews' arrival while Kazim Gulamali (red cap) battles NM Klaus Pohl. 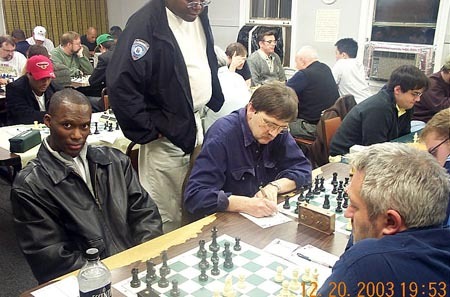 The Chess Drum's Daaim Shabazz awaits move from GM Aleks Wojtkiewicz.